← What would it take to convince you that you were wrong? The appeal to authority fallacy (a.k.a. argument from authority) is easily one of the most common logical fallacies. This is the fallacy that occurs when you base your claim on the people who agree with you rather than on the actual facts of the argument. This may seem fairly straightforward, but it can actually be quite confusing, and I often see people incorrectly accuse others of committing this fallacy. The problem is that there are clearly times when it is fine to defer to an expert. For example, we constantly defer to doctors, and there is nothing wrong or fallacious about trusting their diagnoses and taking the recommended treatments. My intention is, therefore, to try to clear up some of the confusion about this fallacy and explain when it is and is not appropriate to defer to experts. This one is fairly trivial and easy to spot. It occurs when you quote someone famous or cite their opinion while overemphasizing the person who said it. You may for example see a meme on Facebook that quotes George Washington and puts his name in enormous, bold caps. Doing that is really a type of inadvertent appeal to authority fallacy because you are essentially asserting that we need to accept the argument in this quote or at the very least take it seriously because of the person who said it. The problem is of course that no one is infallible, and even very intelligent people make mistakes. This is especially true when it is a quote about an opinion, philosophical view, etc. To be clear, you should obviously cite the source of the quote, but whether or not the quote should be trusted or taken seriously must be determined by the actual content of the quote, not the fame and reputation of the person who said it (also, on the internet half of the quotes are fake anyway, but that’s another problem entirely). This is probably the most common occurrence of this fallacy, and it happens anytime that you cite someone who is not actually an expert on the topic at hand. In fact, this mistake is so pervasive that many people actually refer to the appeal to authority fallacy as the inappropriate appeal to authority fallacy. Some cases of this are pretty easy to spot. For example, Jenny McCarthy pretends to be an expert on vaccines, and Vani Hari (ak.a. the Food Babe) has deluded herself into thinking that she is an expert on nutrition, but neither of them have any real qualifications in science (i.e., they have no formal training on the topics they preach about, they have never conducted original research, they have never published a scientific paper, etc.). So if you reference them as an authority on a topic you are committing an inappropriate appeal to authority fallacy. To be clear, the fact that they aren’t experts doesn’t automatically mean that they are wrong or that you can reject everything that they say out of hand. Rather, it means that there is no a priori reason to think that they are right. In other words, you cannot simply defer to them as experts, because they are not experts. A more common and insidious form of this fallacy occurs when you try to legitimatize a view by citing pseudoexperts. These are people who do have qualifications in some tangentially related field, but are not actually experts on the specific topic at hand. Dr. Sherri Tenpenny and Dr. Mercola are classic examples of this. I frequently see anti-vaccers cite them in an attempt to validate their views. They assure me that their views must be legitimate and scientific because there are people with M.D.s (such as Dr. Tenpenny and Dr. Mercola) who agree with them. The obvious problem is that Dr. Tenpenny and Mercola are both osteopaths. They have absolutely no qualifications in immunology, epidemiology, or any other field that is relevant to vaccines. So even though they have M.D.s, they are not experts on vaccines. You see, in science, being an expert requires that you do original research on the topic that you are purporting to be an expert on. Neither Dr. Tenpenny or Dr. Mercola have ever done any original studies on vaccines, and they frequently demonstrate a fundamental lack of knowledge about how such research is actually done (watch this video for a hilarious example). This problem is, of course, not limited to anti-vaccers. Creationists love to do this by citing scientists who are also creationists. Dr. Raymond V. Damadian is one of the more famous examples because of his role in the development of MRI technology. The fact that he made important contributions to medical science does not, however, qualify him as an expert on evolutionary theory, and his views have absolutely no bearing on the legitimacy of evolution. Climate change deniers employ a similar strategy. The fraudulent Oregon Petition is a perfect example of this. It claimed to have accrued the signatures of over 31,000 scientists who disagreed with climate change, but a quick examination of the petition reveals that many signatures are not “scientists” by any reasonable definition (multiple signatures came from veterinarians, for example), and even among the actual scientists, many signatures came from totally unrelated fields. In fact, it appears that only 39 of the signatures came from actual climatologists! The point is simple: if you’re going to cite an authority, it needs to be someone who is actually an expert on the topic that is being discussed. Otherwise, you are committing a logical fallacy. So far, I have only been dealing with cases where the person being cited is not actually an expert on the specific topic being debated, but what about the cases where he/she is actually credentialed in that field? In this case, you’re welcome to cite them. Anyone who has ever looked at a scientific publication has no doubt seen a lengthy works cited section referencing many other researchers. As I will explain more in the next section, you can even construct a probabilistic argument around a strong consensus of experts. A probabilistic argument is one in which the conclusion is probably true. Unlike deductive arguments, the conclusions of probabilistic arguments are not absolutes, but otherwise, they follow the same rules as deductive arguments, and it is still illogical to reject the conclusion without an evidence based reason for doing so. The key here is that you must always ensure that you are using a consensus as support for your position, not as proof of your position. I will deal with this idea of deferring to a consensus more in the next section, but for now the point is that you can cite legitimate experts as long as you aren’t using them as proof that your position is correct or valid. We defer to experts all of the time, but for some reason when it comes to science and certain medical topics (like vaccines) people suddenly think that they know more than the experts. The final variation of this fallacy is another very common one (it’s actually closely related to an inflation of conflict fallacy). It occurs when you cite a few credentialed authorities as support of your position even though that vast majority of experts disagree with them (note: this strategy is generally fallacious even if you are attempting to make a probabilistic argument). It is important to realize that no matter what crackpot position you choose to believe in, you can find someone, somewhere with an advanced degree who thinks you’re right. So the fact that you found an immunologist who thinks vaccines are dangerous or a climatologist who thinks that the sun is driving climate change does not automatically mean that those positions are correct or even valid. You should always fact check whenever possible, regardless of the person making the claim. The problem is, of course, that as a layperson, it can be difficult or even impossible to adequately investigate some claims, and all of us have to defer to experts at least some of the time. No one can be an expert on everything. The question is then, how do we do this without acting illogically? In other words, how do we defer to experts without committing an appeal to authority fallacy? A good rule of thumb is that you don’t need to be an expert to accept a consensus, but you do need to be an expert to reject one. In other words, your default position should always be the one held by the majority of experts in that field, especially if it is a very large majority. To be clear, it is always possible that the consensus is wrong. I’m not advocating that you view a consensus as irrefutable proof of a position. Rather, what I am arguing is that you, as a non-expert, should be very, very cautious about claiming that the majority of experts are wrong. To put this another way, how likely do you actually think it is that you figured out something that the majority of experts missed? To give a simple illustration of this, imagine that I take my car to 100 mechanics, and 97 of them say that transmission is the problem, and three of them say that it’s my engine. I know a fair amount about cars and I do almost all of my own mechanical work, but I am still far from an expert. So, how am I as a non-expert supposed to decide which mechanics to trust? Well, common sense tells us that it is more likely that the large majority of experts are right. Further, even though I am knowledgeable about cars, it would be absurdly arrogant and presumptuous of me to proclaim that I understood what was wrong with my car better than 97% of professional mechanics. I could, of course, give many other examples of this. If we go to several doctors with a problem and all or most of them tell us the same thing, we usually have no trouble accepting their diagnosis, because their experts. We defer to expert lawyers, contractors, mechanics, etc. all the time, but for some strange reason, when it comes to science, people suddenly feel empowered to reject the expert consensus and side with some internet quackery instead. This is a very dangerous thing to do. On topics like global climate change where roughly 97% of expert climatologists agree that we are causing it, it seems rather risky to side with the 3% who disagree with the consensus. Again, to be perfectly clear, I am not advising that you should always just blindly follow the popular view. 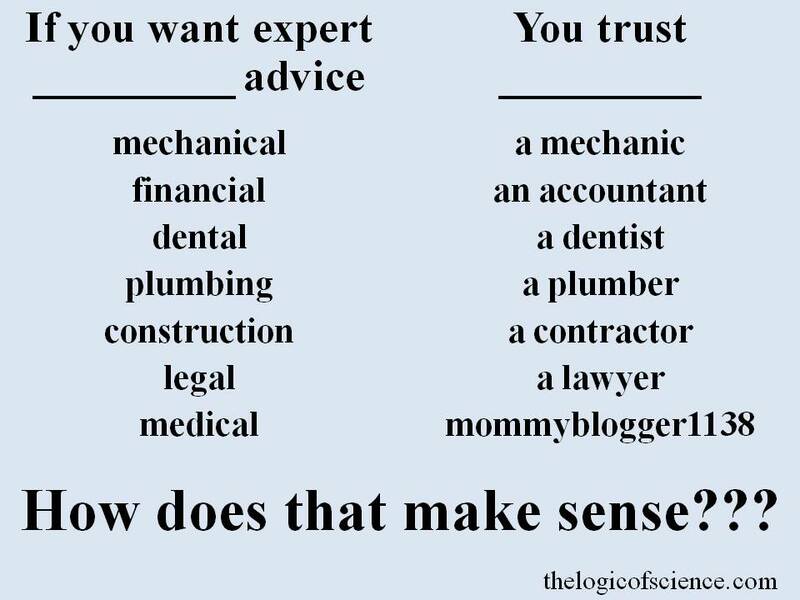 You should always make every effort to learn as much about a topic as you can, but after you have carefully reviewed all of the evidence, if you have reached a different conclusion than the vast majority of credentialed experts, you should be very trepid and cautious about that conclusion. You may be right. That possibility always exists, but you should really think long and hard about the probability that a few hours on the internet allowed you to figure out something that was missed by hundreds of experts with years of experience. The underlying reason for accepting a consensus relates back to the burden of proof. Remember, the person making the unparsimonious claim is the one who bears the burden. In other words, if you are going to claim that 97% of climatologists are wrong about climate change, every major medical organization in the world is wrong about vaccines, virtually every biologist is wrong about evolution, etc. you need some extraordinary evidence to back up that claim. This is why I stated earlier that you really need to be an expert before you reject a consensus. For example, I am not an archaeologist, and I do not need to be an expert on archaeology to accept the consensus that ancient Egyptians built the pyramids. I do, however, need to be an expert to say that the consensus is wrong and aliens did it. It is not valid for me to make that claim unless I have spent years studying hieroglyphics, examining remains, etc. To give another example, it’s one thing for someone who has spent their entire life doing research in biology to proclaim that they have evidence that discredits evolution. It’s another thing entirely for someone to spend a few hours on the internet, then proclaim that they have found evidence that nearly every biologist in the world is either ignorant of or has chosen to ignore. That is an extraordinary claim, and it requires extraordinary evidence. Further, it’s important to realize that the research and results of these outliers who disagree with a consensus are going to be scrutinized by the rest of the scientific community, and more often than not, that scrutiny reveals fundamental problems with the research. To recap, a consensus is certainly not infallible, and you should do your best to learn as much about a topic as you can (always by using good sources), but if your conclusion is that the consensus is wrong, you should be cautious of that conclusion and carefully reexamine your evidence. It is possible that you’re right, but if you are honest with yourself, you’d have to admit that it seems unlikely that reading a few websites has endowed you with superior knowledge than you would get from years of careful training and actual experience. So the burden of proof is on you to prove that the consensus is wrong, and you need some extraordinary evidence. Perhaps most importantly, you need actual evidence. The fact that a few experts agree with you does not make your position valid, and it is fallacious to base your argument on the fact that a handful of experts think that you’re right. This entry was posted in Rules of Logic and tagged appeal to authority fallacies, Bad arguments, evaluating evidence, logical fallacies, rules of logic. Bookmark the permalink. I agree in general with the points made in this post, but I would add a note of caution against committing what I would call the “appeal to authority fallacy fallacy” whereby a position is too quickly dismissed because it is held by a minority of experts, or largely only held by non-experts. Just as with non-experts there is no a priori reason to believe that experts are right. Ultimately deferring to others or citing their work or arguments, be they expert or non-expert, is all probabilistic rather than deductive. Of course, when weighing arguments and probabilities, more weight should be given to the experts. One must always be cautious of the ‘fallacy fallacy’ and use judgement when applying these rules. That is why they are called the ‘informal logical fallacies’. But I don’t think we need a secondary ‘inappropriate use’ label for every fallacy or an inverse of every fallacy. I find it interesting how sutble the differnece between reason and a fallacy can be. A category I have been interested in lately is the person that appeals to their own authority. I am referring to the type who puts forward an argument, and when questioned, just states their own authority without addressing the actual questions. they might have studied, and are probably more expert, but that doesn’t actually answer your concerns. One approach informs, while the other is merely used to suppress. The exception to the “Citing a small minority of experts when an opposing majority consensus exists” is in the case of Jesus mythicists (e.g., Dr. Robert Price and Dr. Richard Carrier). They are a small minoriy among biblical scholars and, tending to be atheists, lack the motivated reasoning displayed by the majority, who reject mythicism, but are mostly christian.